When trees are cut down to ground level or above, they leave a “tree stump” where nothing can grow except mushrooms and shoots from the still living root system. The most common way to get rid of tree stumps is to have them ground below ground level, this is Tree Stump Removal. This can be done when the tree is first cut down or much later. Special tree stump grinding machinery is necessary and comes in a variety of sizes, for use depending on the size of the tree, how deep the tree stump is ground and how much access the tree stump grinding service has i.e. getting through a fence to a backyard. StumpCo complies fully with all the health and safety law requirements are are fully insured against all work undertaken. StumpCo fully believe in re-cycling wherever possible, and to this end Stump Co will reuse chipping's for Woodchip mulch. 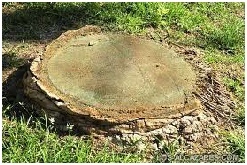 StumpCo offer a tree stump removal and tree stump grinding service for residential and corporate customers. Owned by Wayne Hargreaves and based in Leeds, StumpCo cover a large geographical area, click to see if you are in our serviceable area.